North Bovey can boast a typical and picturesque village green that is studded with artefacts from a bygone age. Sitting majestically in the shade of a noble oak tree stands and ancient granite cross whose restoration bears witness to the deep regard in which these venerable Christian symbols stand. Nobody knows exactly where the original location of this cross once was but it certainly is not where it stands today. Up until 179 years ago this cross had a very different location, depending on whose work you read, it was either lying in the nearby Bovey Brook, (Thornton 1901, p. 67) or serving as a footbridge over a small feeder of the Bovey Brook, (Crossing, 1987, p.152). What both authors do agree on is that in 1829 at the instigation of the then curate in charge of the parish, Reverend J. P. Jones, the cross was rescued from its plight and restored to the village green. He mustered a team of farmers and their horses who then dragged the cross up into the village. Thornton tells us that this act was a celebration of the passing of the Catholic Emancipation Act passed in the April of 1829. Apparently he managed to convince the folk of North Bovey that by restoring the cross to its former glory would result in divine intervention with the village’s prosperity. It is quite possible that this particular cross did in fact serve as a waymarker that stood beside the ford across the River Bovey. The Reverend Jones also obtained a socket stone for the cross which was to recieve the cross shaft although there is some speculation as to whether this was the original socket stone in which the cross sat. Starkey (1989, p.72) relates how the cross, ‘occupies a socket stone that was clearly made for a different type of cross. The socket is carefully worked, it is square below and octagonal above and is intended to take a cross having a rectangular shaft with chamfered corners. This cross has a plain rectangular shaft which only half fills the socket.’ He also considers that the cross which originally fitted the socket stone served as the original village cross which disappeared a long time ago. There is also a tradition that the head of that early cross is built into the parlour wall of the cottage which now stands opposite the later cross? 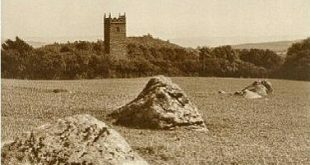 If you look at the two images of North Bovey Cross above it is evident from the early postcard that it has gained an extra socket. This is due to some further restoration work necessitated by the cross being skittled down by a vehicle that mounted the green in 1951, (Harrison, 2001, p.234). Today’s cross stands at a height of 1.24 metres and has an arm span of 63 centimetres this along with a shaft circumference of 66 centimetres makes it one of the less imposing of Dartmoor’s granite crosses, (Sandles, 1997, p.72). Starkey, F. H. 1989. Dartmoor Crosses and Some Ancient Tracks. Printed Privately. Thornton, W. H. 1901. Some Notes on the More Recent History of a Few Ancient Crosses which are to be Found in the Neighbourhood of North Bovey. Devon and Cornwall Notes and Queries – Vol I.